Mortgage interest rates are still pretty low on a historical basis, but other factors may keep home sales from picking up. Mortgage interest rates have risen considerably since falling to all-time lows in late 2012 and early 2013, but they still remain low on a historical basis. As of the most recent data, the average interest rate on a 30-year fixed-rate mortgage is 4.20% and the 15-year rate is at 3.31%. Despite the low rates, other factors might cause the housing recovery of the past couple of years to lose steam. Who said the housing recovery is slowing down? It may seem as if the real-estate market is booming in some parts of the country, but the numbers don't lie. For starters, housing starts fell more than experts were predicting, dropping 6.5% in May. The summer months are typically the peak of "selling season" in the real-estate market, as kids are out of school and the weather is more pleasant, making it easier to move. So what this data tells us is that homebuilders are slowing the rate of building new homes going into selling season, which I see as a bearish sign for the housing market. Also, according to the most recent existing-home sales data, single-family home sales grew by only 0.5% from March to April, which is an extremely slow pace of growth, considering how unusually frigid March was. Existing-home sales are on pace to hit 4.7 million this year, down nearly 9% from last year's 5.1 million and well below the 5.5 million annual sales that would be needed for a "healthy" real-estate market. 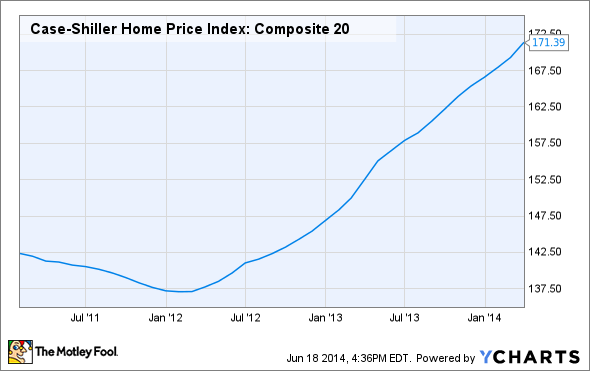 The evidence definitely suggests that the housing market's 2013 recovery has fizzled a bit in 2014. Since bottoming out in early 2012, the average U.S. home price has risen by about 27%, and the gains have been even more dramatic in the areas hit hardest by the foreclosure crisis. For example, home values in Las Vegas have risen by 58% since the bottom. While this is great for homeowners who have been underwater on their mortgages, it's not good news for buyers. A lot of people may think their "window of affordability" has passed and are not willing to jump in at the current prices. Even at 0% interest, most of us couldn't afford to buy a Porsche, and that's similar to what's happening here. No matter how low interest rates are, expensive is expensive. Sure, a mortgage is relatively cheap -- if you can get one. Credit standards have relaxed a little since the years immediately following the crisis, but they remain pretty tight on a historical basis. The average FICO score for an approved conventional (not FHA-insured) loan is 755, which is well in the realm of "excellent" credit. In fact, the average score for those rejected for a conventional mortgage had a credit score of 724, according to the Ellie Mae Origination Report (link opens PDF), which itself is in the range of "very good" to "excellent" credit. There is always the FHA option, which approves buyers with scores as low as 580, but FHA loans are expensive. For a full discussion on the extra costs of FHA loans, read this -- but in a nutshell, the payment on an FHA loan could be nearly 45% higher than a conventional loan for the same home. So, even if buyers are willing and able to buy a home at the new, higher prices, it can still be a challenge obtaining the financing for the purchase. This could be bad news for homeowners who may want to sell, but it could also prove to be good news for buyers and the housing market as a whole. After all, the goal here is to have a healthy housing market -- not necessarily cheap, expensive, growing, or shrinking, but healthy. And it may take some time to get there. Maybe prices will need to come down a bit. Maybe credit will need to loosen considerably before enough buyers will be able to enter the market. Whatever needs to happen for the real estate market to become healthy once again, one thing is for sure: Low mortgage interest rates are certainly not the only piece of the puzzle.